Blog — Feral 5 Creative Co.
Here’s a short video that shows screenprinting guru Briar Craig discussing the medium of printmaking and UV cured ink. I got the footage while I was at UBCO’s printmaking studio in February, during my reading break. I’m in my last semester of a Visual Journalism graduate diploma at Concordia University in Montreal, so I’m just trying to get my video skillset up to par before I’m catapulted back into the real world. I missed the studio so much that I literally drove across the continent to get back to it. It’s extremely difficult to find a place that has a UV drier, because the ink is used more in commercial practice than in fine art. Having used both air dry and UV cured ink, the latter is far superior but there are still only a handful of universities in Canada (and probably North America as a whole) that recognize this. The producer of the inks in North America went out of business, and because of an increased cost, both Queens University in Kingston, ON and Concordia here in Montreal have stopped using the UV ink system. From what I can tell, it seems to be less an issue of cost and more an issue of not having the right people to teach the method. People often tell me my prints don’t look like screenprints at all, and when I try to describe how great UV ink is to other printmakers I usually just get a blank stare. It’s sort of like trying to convince someone who’s never seen or heard of a plane that it’s faster to fly across the ocean than it is to sail; they don’t understand how it works, their own method seems fine, and they’re not interested in buying more equipment just to do something they can already do a different. But a plane can take you more places much faster, and the same can be said of UV ink. This piece was recently printed at the University of British Columbia (Okanagan). It represents 2-3 weeks of linework design that I completed in March, during my last month of a 3 month artist residency in Skagaströnd, Iceland. The piece is an artistic representation of an academic article found here. As mentioned in the blog post below, the piece represents the cycle of Mercury in diet of the arctic fox's that live along the coast. For the fox, they are exposed to mercury mainly through the birds that they eat. Those birds, in turn, eat fish that are contaminated, and those fish eat other fish that have mercury and so on and so on. The highest mercury levels occur at the top of the foodchain which, in this case, is the arctic fox. As the icecaps in the arctic continue to melt, pollutants that have been stored in the ice for decades will be released into the ocean, having a negative impact on any animals that have a marine diet. So my time in Iceland ended with the month of March and I've shipped off to the Faroe Islands for the next few weeks as a participant in the 'Arctis Exchange', an artist exchange that takes place between the Faroe Islands and the US. I arrived in Torshavn on the first and I've just been settling in with my host family and starting some new projects. I've got a bad cold at the moment, something Joel--the man who runs the Arctis Exchange--claims is a result of the high humidity here, but after living a hop and skip from the sea in Skagaströnd I think this illness is just a culmination of all the stress from finishing up my work in Iceland. I took some photos of my final installation for the open house. I finally cleaned off the last of the bones that I wanted to keep from the dead fox I recieved from a local hunter. 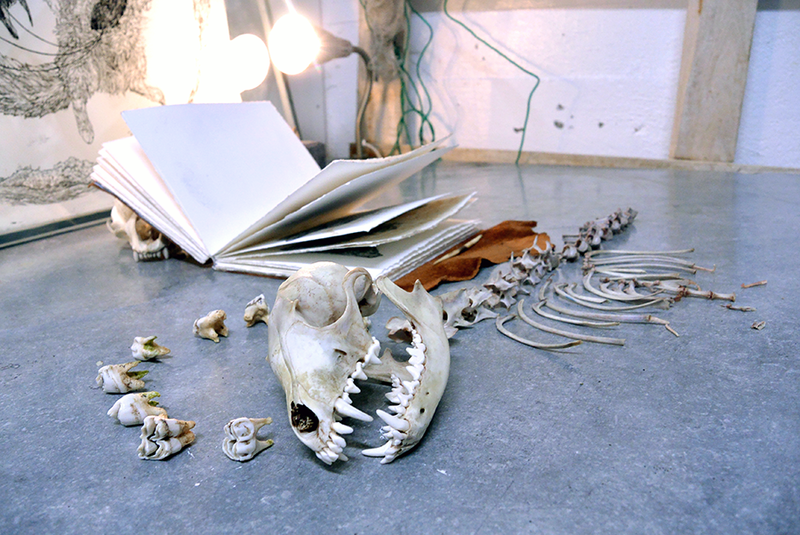 I pulled reindeer teeth out of a spare skull in the studio and circled them around the fox skull like a halo because foxes in Svalbard and greenland that scavenge on caribou are protected from oceanic pollulants because of their inland diet. There was a scientific article where I read about this recently and I hope to do a small clayboard or screenprint piece on the subject when I have time. It was a little bittersweet seeming him laid out like that and I think the full impact of my time in Iceland won't really sink in until I return to North America. 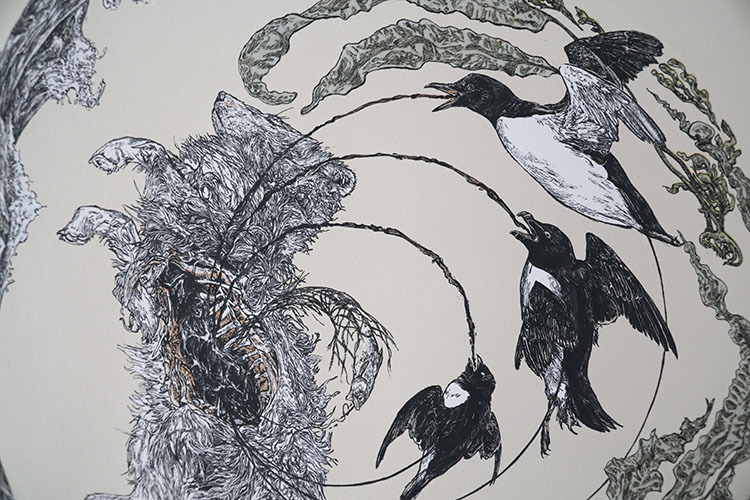 The big piece in the background is the final design for the key layer of a print based on the cycle of mercury contamination that afflicts the arctic fox's foodchain along the coast. Mercury (Hg) ends up in the ocean via airborne mercury from coal-fired power plants and is one of the pollutants that biomagnifies up the foodchain, meaning that at the top of the foodchain--i.e. at the higher trophic levels--the mercury levels are much higher than at the bottom of the foodchain. Mercury can have negative impacts on the development of a fetus because it's able to cross the placental barrier and it can cause neurodegeneration because of its ability to cross the blood brain barrier and enter the brain. Neurological effects of a substance are difficult to measure in wild animals but in arctic foxes the mercury levels in certain areas (such as on Mednyi Island) have been bad enough to visibly affect the quality of their fur, which is vital for winter survival. The article that largely inspired this piece can be found here. The coastal birds that these foxes eat represent a prominent source of mercury in their diet, being victims of biomagnification themselves. 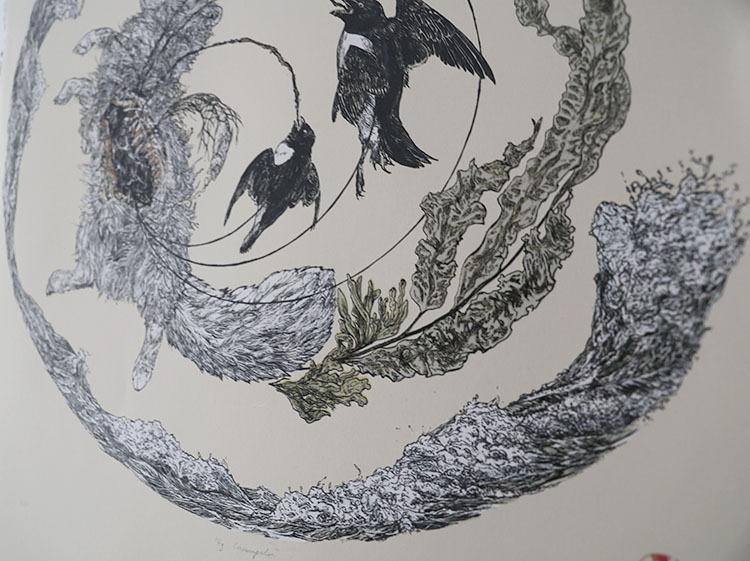 In this image, I depicted some of the bird species that the scientific literature deems affected by oceanic mercury. In order of size (smallest to largest) they are: the Little Auk, Razorbill and Common Murre (or guillemot). The fish jumping free of the netting is a young cod, and I included it as a nod to the fact that the threats to this foodchain are also a threat to the local fisheries that provide the food we consume. Here are some of the foxes I've been doing daily drawings of. I have been busy with a number of things, namely doing an appplication for grad school so I couldn't update as frequently as I wanted between that and some freelance illustrative work. I reorganized my portfolio page so have a look! I'm working on finishing up the last 5-6 pages of this book and then I will have them properly scanned and made into a slideshow for everyone to flip through. For now, enjoy this small sample, I believe most (all?) of them haven't been put up on instagram. Some sort of reproductive record is taken during the dissections of each fox; for a male the testes are removed and weighed and for a female the placental scars inside the uterus are counted. Outside of the breeding season, the male’s testes are only a third or a fourth as big. A female’s uterus, if she has never bred before, looks like a thin, semi transparent rubber band tucked away behind the other organs. Ester—the biologist doing the dissections—would cut a long incision across the lower abdomen and pluck out the thin uterus with one finger, holding it taut like a guitar string. In good humor she would say ‘it’s a virgin!’ almost every time. Like the dormant testes, the band of tissue seems almost vestigial compared to a vixen that has been a mother. A uterus that’s carried a litter to term has placental scars, dark bands across the uterine horns that indicate the number of kits in the last litter. It’s hard to see in my illustrations, but one of the females had two full scars and one that was only half as big. The half scar, Ester told me, was probably from a fetus that had not been carried to full term. 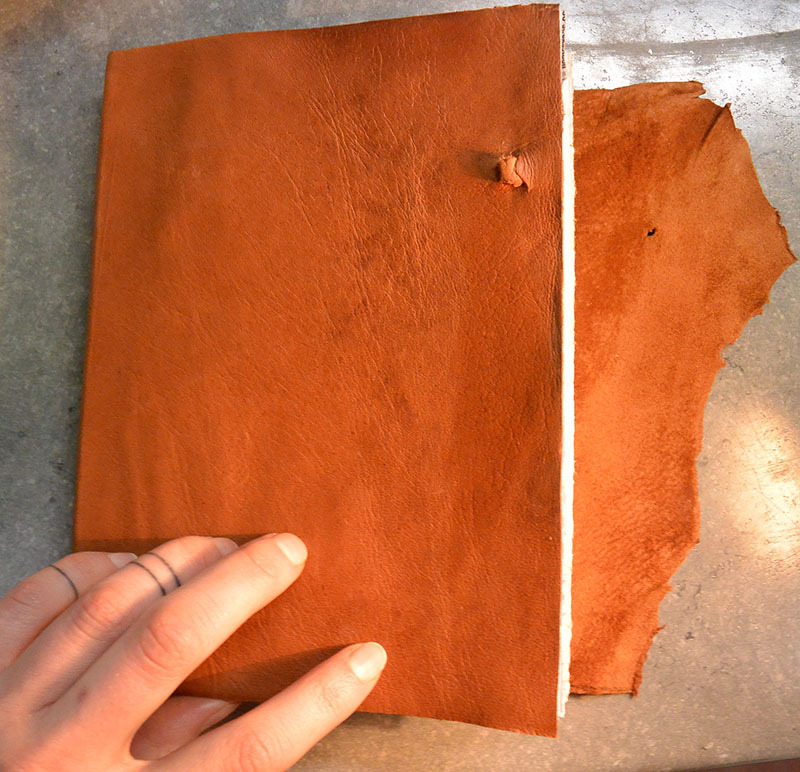 Except we are collecting the pages of the fox’s journal, taking samples and notes and making translations in order to see what we might learn from the short history of each body passing under the knife. For the next month and a half that I have left at the Nes Artist Residency I plan to fill a book with illustrations of dead foxes. 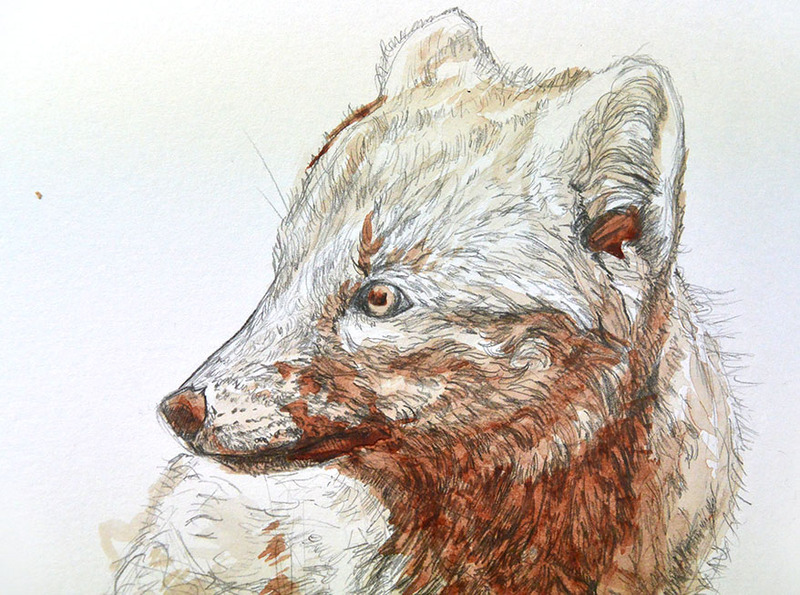 I’m drawing from photos I took of arctic fox dissections at the Natural History Museum of Iceland when I was with Ester Rut Unnsteinsdóttir, a prominent fox biologist here who collects data and tissue samples from the dead foxes that are donated by local hunters. She has been doing this work for a long time and graciously agreed to let me tag along with her in the lab. 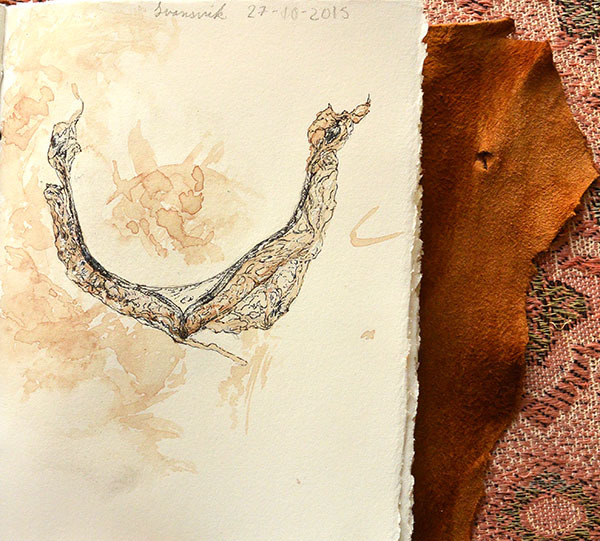 The blood for this project was collected from a fox that a Skagaströnd hunter killed. 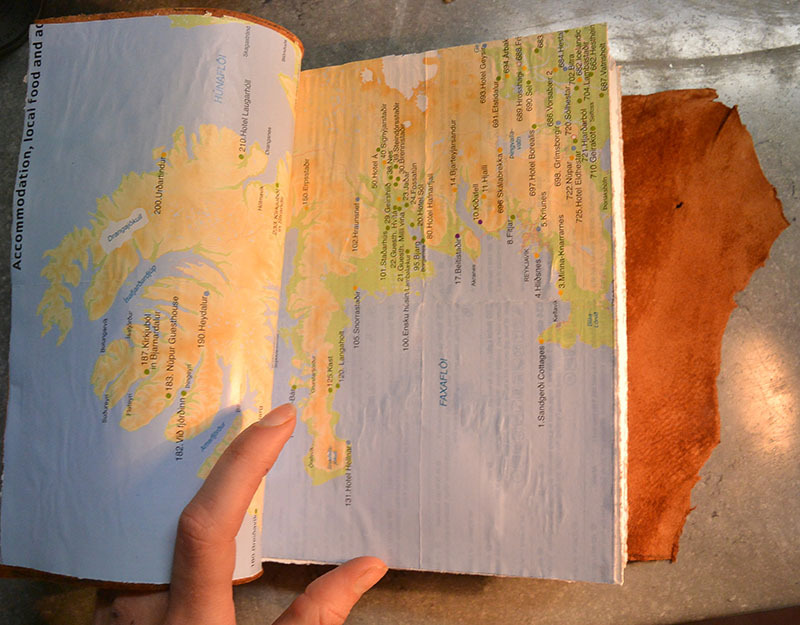 The book is handmade with lambskin from the tannery in Sauðárkrókur (Atlantic leather), a cheap map of Iceland I found in a brochure, and Stonehenge paper I brought from home. I draw these foxes because there is something so intimate dissection, about opening up a body that has become an object and turning a life to statistic. It would be very easy to confuse this as an act of apathy, but the foxes laid down on the dissection table are afforded the greatest ceremony a good shot can offer them. From their hair and tissues, their weight and livers and reproductive organs, we can learn a great deal, and it’s in this learning that we practice compassion for this animal that Icelanders have maligned as a pest for so long. The foreshortened life of a shot fox informs us of the whole in more ways than we have time to explore. And sometimes when I look at their bodies curled up or combative or contorted into or against the end they’d always feared, I think of us. I think of all the barehanded dissections we perform on each other when—almost without realizing it—we crack the sternum and begin digging for the heart. We open up the ones we love, and yet we still know more about foxes than all the hearts we've palmed. 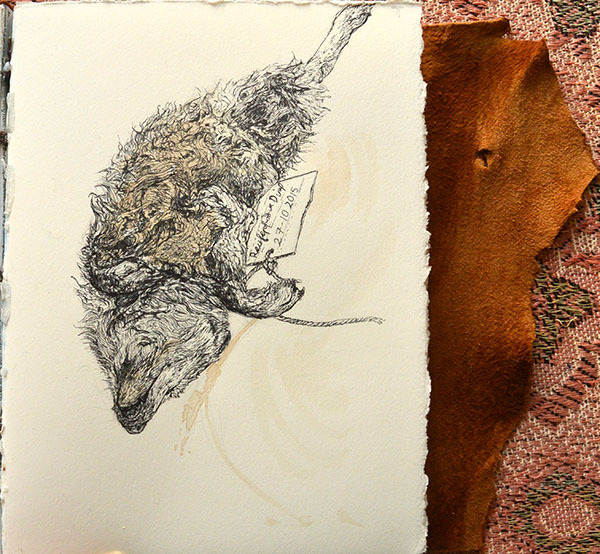 Lately I have been doing a lot of drawing from life, observing dead foxes I have acquired from local hunters or observing some dissections at the Natural History Museum of Iceland. Above is an image I made using fox blood from one of the foxes shot by a hunter here in Skagaströnd. I undestand the controversy in using animal parts in art, but I just wanted to state that had I not asked for the body, it would have been thrown into the garbage can. I'm in the process of defleshing the skull and used the body as much as I could for anatomical studies before I had to get rid of it. I collected more fox blood before getting rid of the dead fox and I plan to do a small series of 32 paintings/ drawings in a book I've made. A friend of mine, Brian Cheung (http://briancheung.net/) was doing a series of seascape paintings during his time here at Nes in Skagaströnd and I thought it would be fun to do the same. 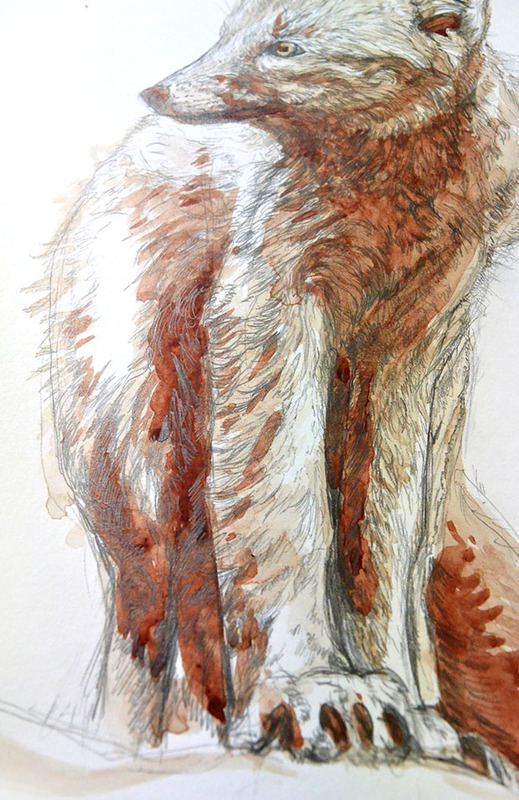 Of course, instead of depicting the landscape, I'll be drawing vulpine corpses. It's an artistic exercise but also a long, convoluted metaphor that I won't go into here. "The Hermit and the Thief" is 14.5 x 20 inches. 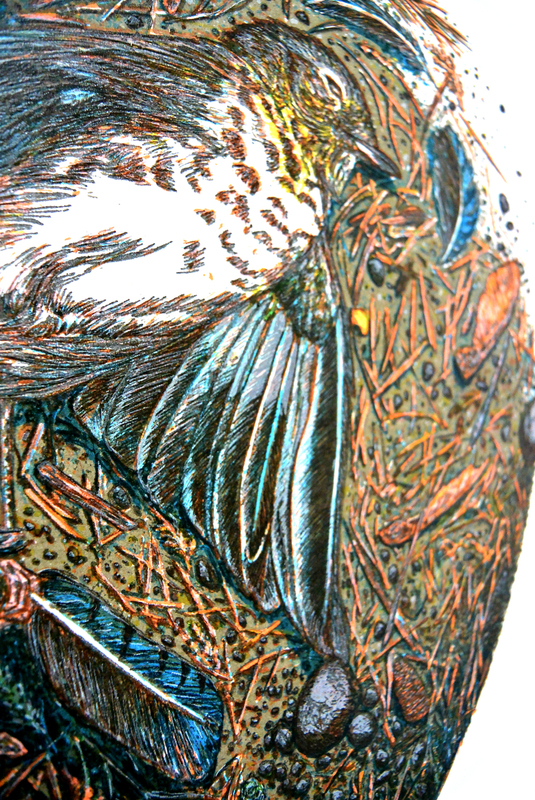 It depicts a dead hermit thrush holding the feather of a Steller's jay. Steller's jays are notorious nest thieves, and I imagined that the thrush had met an untimely end in pursuit of defending its eggs. I started this piece one night thinking it would be a small side project, but it inexplixably turned into something that took far more care than I had initially planned. There are 9 layers in all, each one semitransparent so that they interact to create different patterns and textures when they are lain overtop eachother. Transparent layering is not something that is always utilized by contemporary (particularly commercial) screenprinters. I was taught to do things this way so I hold a certain bias, but I am very firm in my belief that it helps to achieve subtelties and textures that you can't get from fully opaque inks. I used speedball ink mixed with its transparent extender base. I tend to mix the pigmented ink with the transparent base at a ratio that doesn't exceed 50/50, though there are exceptions. The more base you use, the easier it is to pull through the screen and the longer you have before it dries in the pores of the mesh and you have to wash everything out. Halfway through I switched to using exclusively Jacquard ink, which is exceptionally better than speedball. It has a texture like UV ink and tends to go down more smoothly with less 'tack' than speedball. It also seems like you need to mix less pigment with the base, which is remiscent of how I mixed colors when using the UV ink system. Below, you'll find each layer and it's corresponding positives so you can begin to see how the different transparent layers build upon each other. I apologize that the quality is lacking for some of these photos, I snapped most of them while I was actively printing. All of my positives are made using india ink. I use a rapidograph pen or just lay it down on the mylar with a paintbrush. This is the first layer (in the foreground) and the second (behind it), showing the cedar-orange details with the blue shadowing overtop. I decided to print the key image first as a sort of a underpainting, and because it easier for the purposes of registration. That being said, I had some registration issues in the first layer that I didn't notice until the third and had to register things twice or thrice each layer to set things right again. The positive for layer 1 (the positive for layer 2 is inexplicably lost). Layer 3, printed in warm gray. Layer 4, printed in yellow. When lain overtop of blue it creates green and I added it to the pine cones in order to begin building a brown hue and in other places (like some of the rocks) in order to warm up spots that the light would be hitting. The positive for layer 6. Note that for every layer I am trying to add as much depth to the edge debris as possible, building shadows even with warm tones. Layer 7, printed in light gray. With this layer I wanted to redefine many of the rocks, continue to deepen the shadows and add more texture to the bird's wings. Layer 8 printed in white to add highlights to certain areas, particularly on the bird since it was getting lost in the background. Layer 9, printed in dark gray. This final layer redefines pretty much all of the linear detail. The whole edition was split into 2 because I initially printed this layer in black but found I liked a less aggressive tone and printed the rest of the edition in lighter hue. The positive for layer 9. This weekend I was live printing at the Holiday Sale at Atelier Meridian in North Portland, which is always one part fun and one part awkward as I juggle trying to focus with trying to explain the process to people in a short enough time that no ink dries on the screen. I also get a case of the shaky hands while trying to get my registration correct underneath the mylar when other people are watching. This print is one in a small series of giant foxes hanging around Portland landmarks. The foxes themselves are sort of like the giant, unobserved spirits of abandonded industrial structures. I have it in my head that occassionally other animals can see them, thus the cat on the roof (if you can find it). I've affectionately been calling the series 'Foxzilla'. I had printed this on buff BFK and white stonehenge, but I think it looks much better on the buff paper and thus will be making another edition of that at some point. When I was doing a test print of this on Thursday I printed some layers out of order and did not quite get the same subtlety that I was hoping for. In this case all I had to do was lighten things up a bit and switch the order of some layers. I've been told this before but I always have to make mistakes twice before I remember the lesson: The layer that you print last is going to affect the color of the image more. For instance, if you're making green by printing transparent blue overtop of yellow, your green will be more blue because that was the color you printed last and vice versa. With air dry inks I have been printing in the opposite order that I had used with the UV cured inks, i.e. printing the black layer last. The UV cured inks were transparent enough to print that black layer first, which makes registration a lot easier. With the more opaque speedball inks there's no way I would be able to do this, but I recently switched to Jacquard inks. I know this isn't the kind of situation where one follows their nose BUT the jacquard inks have the same stink as the UV and they lay down on the paper with a similar gloss. I suspect they may be transparent enough that I don't have to save my key layer for last. I'll have to wait for the next print to find out, alas. So in my infinite quest to conquer the art of printing on fabric, I decided to move back to plastisol. In October I did stretch some tiny, tiny screens and print small designs using plastisol, and it worked out well enough. I absolutely abhore the feel of that ink, but after battling with the fast-drying beast that is discharge ink, I decided it was better to stick with what I know than risk going through the frustation I had in August (in short, I was just ill prepared for the speed that one needs for discharge inks to prevent them from drying and I was printing outside on my deck with a crosswind that made things worse). So! I took the key lineart for the design I had tried in August and printed it in white on some vintage bandanas I had acquired wholesale from an army surplus store. The design is 20"x20" with some aspects of it closer to the edge of the metal frame than they rightly should be. I don't have the weight or arm strength to get even pressure on the squeegee so I had conscripted my boyfriend to do all the squeegee pulling for me. Which is, of course, the perfect point at which a story pivots to disaster. My flash cure dryer was a few degrees from the proper temperature when it tripped the circuit breaker. It did this with two outlets actually until we gave up on it. In July it had tripped the circuit breaker for half of my house, which isn't that big of a deal except that our house is the ping point through which people on Sauvie's Island get their internet and the internet service was affected. This is as close I can come to a formal apology to all those people who had to live like heathens without wifi for 10 hours. Anyways, I had read online that you could cure plastisol in the oven. I distinctly remember thinking this was a great way to burn your house down, but with no formal reports of house fire fatalities I decided it was worth a shot. We packed 10 or 11 bandanas in the car between screens and frames so they didn't touch eachother and smear, then we drove very slowly back home. The first rule of sticking fabric in the oven is DON'T let anything touch the sides. Unfortunately, I didn't know this for my first bandana, which caught fire and ended up in the sink. From then on I folded them very carefully so they were well contained within the baking sheet. I had to readjust the way it was folded so that every part of the design got baked for 45 sec. Sometimes I would put them in for longer if the ink was really think; white ink is notoriously hard to cure. I'm proud to report that each bandana made it through the washer and dryer without fading! RIP burned bandana, I wish you could join your brothers for sale on etsy and at all the holiday markets. After a long time of pursuing things I enjoy less, I've decided to give in to the creative drive. It's something that has always been there, expressed generously in my childhood, but less so as I got older and then hardly at all in the first half of my undergraduate degree. It bloomed up every now and again, in long fields of free time, but it was always the first thing to wilt when I got busy. Now, I'm not trying to give the "I've always dreamed of being an artist" speech, because truthfully I haven't (my dreams were always more of the scientific persuasion). But I'd like to take some time to try my hand at mastering a craft and learning to better bring my creative whims to fruition. So this is me trying to be a maker, to build something worth looking at, and--ultimately--to make excuses for being aggressively unemployed.